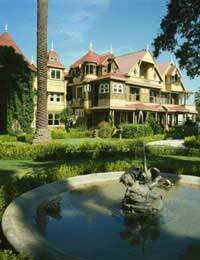 The Winchester House, often known as the Winchester Mystery House, is a house built due to sorrow, fear, and remorse. The spacious Californian mansion was under construction around the clock for 38 years as Sarah Winchester, widow of gun magnate William Wirt Winchester, tried to avoid the ghosts of those killed by the guns her husband’s company made. William Wirt Winchester was the son of Oliver Fisher Winchester, the manufacturer of the Winchester repeating rifle. The senior Winchester made the Winchester Repeating Arms Company a very successful business and when he died in 1880, ownership of the company passed to William. William had married Sarah Lockwood Pardee in 1862. Their only child, Annie Pardee Winchester, died of marasmus only six weeks after she was born. Sarah was overcome with grief. She would never have another child. Just as she was beginning to recover from the pain of Annie’s death, tragedy struck again. William died in 1881 of tuberculosis, only one year after inheriting the company. Sarah was a rich woman – William had left her close to $20 million dollars. But her heart was broken over the loss of her only child and her husband. A friend, knowing how upset Sarah was, suggested she see a spiritualist. The spiritualist told Sarah that William was there with her, but that the family was cursed, due to all the harm the Winchester rifles had caused. The spiritualist suggested that Sarah should build a home for all the souls lost because of the rifle. The legend goes that the spiritualist told Sarah to build and build and build on the house, for if construction ever stopped, Sarah would die. Sarah found an eight-room farmhouse with 162 acres of land outside of San Jose, California. It belonged to a Dr. Caldwell. He was reluctant to sell the home to Sarah, but eventually did for $12,500. Then she gathered up a crew of artisans, carpenters, and construction workers and put them to work. She spent the “blood money” as she called it left to her by her husband. In a mere six months, the farmhouse grew from eight rooms to twenty-six. As ordered by the spiritualist, Sarah had people working on the construction of the house 24 hours a day, seven days a week. It is estimated that she had between ten and twenty-two full time carpenters employed. The house construction continued for another thirty-eight years. In the end, there are believed to be 160 rooms, 47 stairways, 47 fireplaces, 13 bathrooms (Sarah had a fascination with the number 13), and 6 kitchens. The home has almost 10,000 windows, thousands of doors, but there are oddities as well. There are staircases that lead into the ceiling, doors that open into windows and second floor doors that open into open space. Things such as this were constructed to confuse the angry spirits. At times, there were close to 30 rooms that were boarded up to help “trap” spirits inside. To avoid the spirits, Sarah slept in a different bedroom each night. Sarah lived to the ripe old age of 83 and died in her sleep in 1922. At that point, the construction stopped so rapidly that many say some carpenters left nails only halfway hammered into the wall. It is estimated that the final cost of the house was over $5 million dollars. Sarah left the house to her niece, Mrs. Marian Merriman. She eventually auctioned off the home and in the early 1970s, it was turned into a museum. But all the spirits of the house didn’t leave when construction ended. Employees and visitors both report strange activities such as organ music playing and pages of books turning, and some have even said they see Sarah. The Winchester House is open for tours every day of the year except Christmas. On Halloween and Friday the 13th, they offer a special flashlight tour. the Winchester Mystery house is intriguing and so interesting..